John was born in Edgware, Middlesex and attended Frith Manor and Finchley Manorhill Primary School in North London. 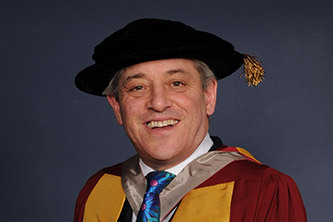 He graduated from the University of Essex in 1985 with a First Class Honours degree in Government. His former tutor, Professor Anthony King, described him as being 'an outstanding student'. There followed a brief spell in merchant banking after which John joined the lobbying firm Rowland Sallingbury Casey, which is part of Saatchi & Saatchi in 1988; soon becoming a board director. In May 1997, John was elected Conservative Member of Parliament for Buckingham Conservative, serving on the front benches in a variety of roles including; Spokesman for Education & Employment and Home Affairs; Shadow Chief Secretary to the Treasury; and Shadow Minister for Work & Pensions. Between 2003 and 2004 John also served as Shadow Secretary of State for International Development. On 22nd June 2009 John became the 157th Speaker of the House of Commons; a position he holds to this day. Three years before taking up his role as Speaker John and his wife Sally began noticing that Oliver - their eldest son, then aged three - didn't seem to be meeting the communication milestones expected for a child of his age. There followed several tests which showed that Oliver exhibited some characteristics of high functioning autism and so was given a statement of special needs. When John and Sally embarked on the process required to obtain that statement, they were advised that it could be protracted, frustrating and often unsuccessful. As it turned out, they accessed help for Oliver relatively quickly and found their local authority helpful. However, John was very conscious that many parents, unaccustomed to letter writing, meeting with officials or having to contemplate appearing before a tribunal, could find the challenge daunting. He therefore resolved to take up the cause in Parliament on behalf of all children. Demonstrating his trademark passion and tenacity, John lobbied Ed Balls, then Children's Secretary, with requests for more attention for speech and language services. He also raised the issue more than 20 times in the Commons over the course of a year. When Gordon Brown became Prime Minister in 2007 Ed Balls asked John to undertake a review of services for children with speech, language and communication difficulties. The product of nearly two years of consultation with experts across the country - including here at City University London - The Bercow Report, made more than 40 recommendations for improving speech and language provision for children and was the first high level policy document to signal the needs of children with communication disorders. 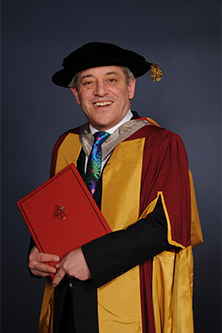 Despite his demanding role as Speaker, John has retained his interest in supporting children with communication needs and has remained a strong ally of the Speech and Language Therapy profession. He is the current president of Afasic, a UK charity supporting children and young people with speech and language difficulties and their families. He also attends and speaks at many events held by schools and local authorities on speech and language therapy services. In 2011 he opened the 'Lost for Words: Lost for Life' conference hosted by City and I CAN, a national charity for children with communication difficulties.